The Delta N610DL Boeing 757 is the carrier's Breast Cancer Awareness plane and has been making appearances at air shows. I spotted at the 2009 Selfridge Air Show and took the cockpit tour. 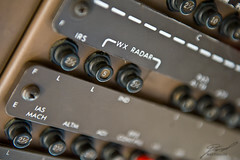 About the only shot in the cockpit I grabbed and liked was this set of breakers for the weather radar. It was still very overcast and I had considered checking the weather radar off the iPhone when we were invited up. I never did check the radar though.